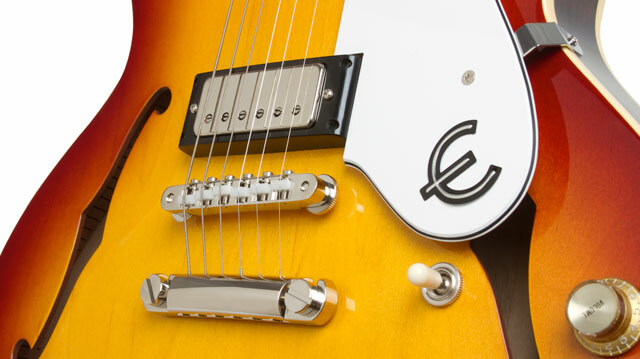 Introducing the new Epiphone Ltd. Ed. Elitist "1966" Custom Riviera Outfit with a Nitrocellulose Lacquer Honeyburst finish, made in Japan at the world famous Elitist factory. The “1966” Custom Riviera merges some of our favorite vintage Riviera mods with the world famous Elitist series for an instrument that might make you fall in love with guitar buying all over again. The Epiphone Riviera is one of Epiphone’s most enduring classics. First introduced in the early ‘60s, the Epiphone Riviera’s semi-hollow design has been a favorite of players from all genres and generations including blues great Robben Ford, Otis Rush, Lou Reed of the Velvet Underground, and The Strokes’ Nick Valensi, who have all found that the Riviera’s legendary ES-body shape could produce great tones with any pickup variation. The Riviera is the kind of versatile axe that is not only great off-the-shelf but is also a great canvas for modifications. 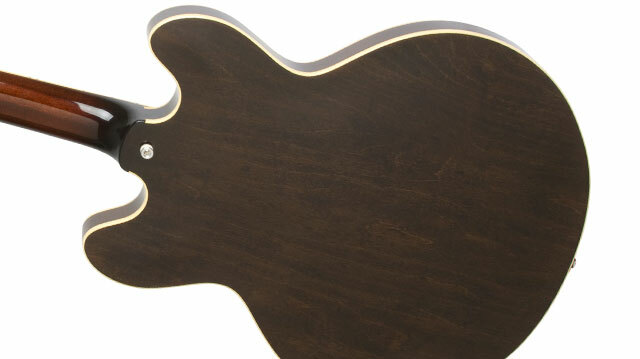 The Riviera has been seen with humbuckers, mini-humbuckers, and P-90s and Stopbar, tremolo, and Trapeze tailpieces. The new Epiphone Ltd. Ed. Elitist "1966" Custom Riviera Outfit is an exquisite hand-made marvel that recreates one of rock and roll’s most legendary instruments. All Epiphone Elitist acoustic and electric guitars are built at our Epiphone factory in Japan that specializes in hand made, highly accurate reissues made with time honored methods and impeccable attention to vintage detail and quality, including period-correct USA pickups and electronics. Epiphone Elitist instruments also feature traditional hand rubbed nitrocellulose color finishes that enhances a guitar’s look over time with gradual shading and fading patterns that are as unique and personal as your own story. Today, Epiphone’s Elitist Series instruments are some of the most sought after by players of all styles, and the Elitist factory in Japan is considered to be one of the premier instrument factories in the world. The new Epiphone Ltd. Ed. Elitist "1966" Custom Riviera Outfit is part alternative history and part modern classic, all rolled into one incredible—and affordable, instrument. The new Epiphone Ltd. Ed. Elitist "1966" Custom Riviera Outfit features a 3-ply laminated body and Maple Top with a Honeyburst finish in Nitrocellulose Lacquer that will age with the same subtle shading seen on priceless vintage instruments. The stylish white 3-layer pickguard has the classic metal Epiphone “E”, and inside the upper f hole is a reproduction of the Epi classic blue rectangle model-label found in all 60s Epiphone acoustic and electric guitars. The Riviera has a Mahogany neck that features a 1960s SlimTaper™ profile and is joined at the body at the 19th fret and glued in with a Dovetail joint. The body and neck both have single layer white binding which gives the Custom Riviera a true “1966” look. The 24.75” scale neck has a 12” radius, a traditional bone nut, and pearloid "Parallelogram" inlays. The sloped dovewing headstock has a 60s style “Epiphone” script logo in pearloid. And the Elitist “1966” Custom Riviera stays in tune thanks to world famous Gotoh® Machine Heads with a 14:1 ratio for easy, intuitive, and solid tuning. The Elitist "1966" Custom Riviera Outfit also features Gibson USA Mini Humbuckers, one of the most versatile pickups of any era. Jazz players and rock players alike love mini-humbuckers for their flexibility since they have more overall range than typical single coil pickups but have more bite and articulation than most humbuckers, which tend to break up faster and high volume. Mini-humbuckers were favored by Johnny Winter, Pete Townshend of the Who, and Scott Gorham of Thin Lizzy among many. Like all Elitist guitars, the "1966" Custom Riviera Outfit comes with the highest quality electronics including CTS® 500K Audio potentiometers with Orange Drop 472 Capacitors and easy-turn Vintage-style Gold knobs with metal inserts with pointers. The 3-way Switchcraft™ toggle switch gives you decades of worry-free use. Tuning and intonation is easy and reliable with Epiphone’s timeless Tune-o-matic bridge with tough as nails Delrin® Saddles and a Gotoh® Stopbar. 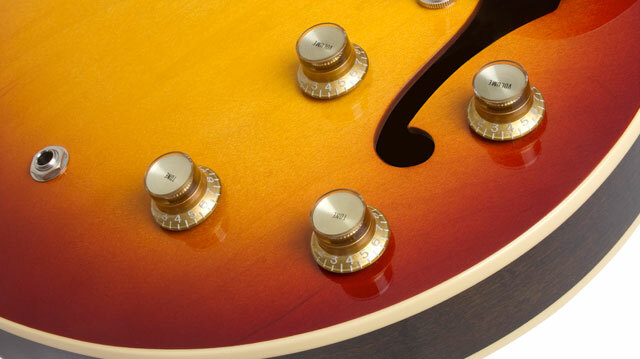 The Gotoh® Stopbar is often found in professional “mods” of vintage models and gives the Custom Riviera rock solid tuning and intonation support. The 1966 Custom Riviera Outfit includes Gotoh® Machine Heads with a 14:1 ratio, vintage-style Gold metal inserts with pointers, a bone nut, a 3-way Switchcraft™ toggle, Tune-o-matic bridge with Delrin® Saddles, and a classic Gotoh® Stopbar tailpiece.